We Review The Best French Presse Coffee Makers to Truly Impress! For a strong cup of coffee, you could dump a handful of grind into the bottom of your mug and fill it full of hot water. Or, you could try a vintage brewing method to extract the most flavour and caffeine using a French Press. So, because we know you are a coffee connoisseur, we have prepared a special feature on one of our favorite methods for brewing that liquid gold. By the end of this article we hope you have everything you need to know about the french press to truly impress. If you are mainly interested in the brands themselves, they are in the latter half of this article (THE WORLD OF FRENCH PRESSES). But, all of the reasoning behind choosing them comes first, so we highly recommend you hear us out before we share our reviews for best French Press coffee maker brands. The origins of the French Press has always been under hot debate. It may have originated from France, where they used a cheesecloths and other self-made metal screens attached to a rod which were pressed into a pot of boiling water. Variations of this method quickly spread across Europe and other parts of the world throughout the 1800s. However, it wasn’t until 1929 when the Italian designer Attilia Calimani who patented the first “official” design for the French Press. That design underwent many modifications until another man, Faliero Bondanini patented a version we know and enjoy today — the Bodum. INTERESTING FACT: ​Did you know that there are other ways to call the French Press? The Italians call is the caffetiera a stantuffo (literally, “coffee plunger”) and the Dutch call it the cafeteire. Let’s focus on the Bodum (which is a patented version of the French Press coffee making method). The aforementioned Italian designer sought a company to introduce his best brewing technology. At the time, Bodum was a popular kitchenware company. Well, as we can see today, that little business union sparked a very popular coffee craze. 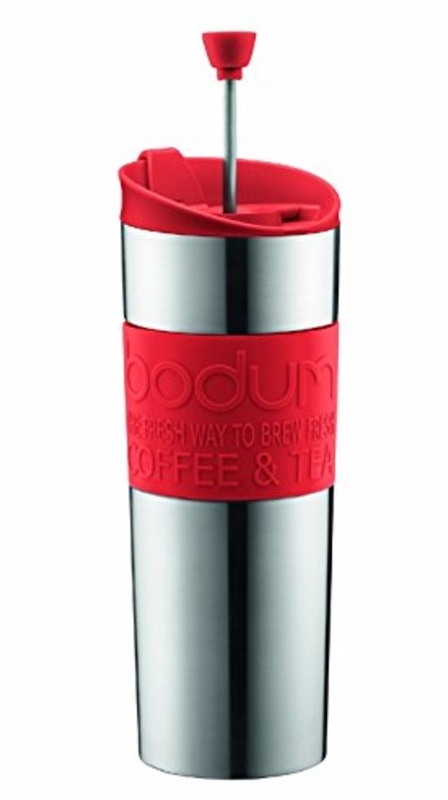 The Bodum has become a household brand name that often removes the title French Press altogether (more on that later). Now that you know a little history of the French Press, let’s summarize. The Italians make great pasta and the French used a cheesecloth to make coffee. C’est une conclusion juste, oui? Let us teach you the proper methods of brewing then look at some high-quality, yet affordable French Presses you can add to your coffee making collection. Measure out the coffee. ​Get a 1 / 2 cup of coffee bean then head down to step 2. Grind the coffee beans. ​The best method is to use a burr grinder with a coarse setting. You want your coffee means to be rough and chunky. Worst case scenario, you can throw the beans into a blender and hack away. Boil the water. ​With a 1 / 2 cup of coffee beans you should use about 4 cups of water. Let the water rise to a boil then cool down for a minute before pouring. For those who want to get really technical, the ideal temperature is 212°C (195°F). Pour the water. ​When the water is the perfect temperature, fill you French Press half full of water. Start stirring for 15 to 30 seconds to allow all the gases to be released. Then fill it up with the remaining amount. Stir the pot. ​Once all the water has been added, stir vigorously. Steep for 4 minutes.​ This is not an absolute number. You should experiment with it. Different kinds of coffee may produce a better brew under more or less time. Press the press. ​When those 4 minutes have passed, push the plunger in and pour yourself a cup of that delightful drink. REMINDER: ​To brew the best, you have to use the best. The Hario (COFFEE GRINDER LINK) is a great burr grinder that can be adjusted to create a fine espresso or a coarse French Press preparation. Perhaps you’re not yet convinced to venture away from your tried and trusted brewing methods. Give us a moment to explain why the French Press makes the best coffee. The French Press doesn’t use any filters. Unlike a paper filter using a drip machine (like the…​), you won’t lose any of the natural oils and finer flavors of from the coffee bean. As well, the standard drip brewing method pours water over the grind and goes directly into your cup. You may be able to extract some of the caffeine goodness, but much of the flavor is lost. Using a French Press allows you to steep your coffee and enjoy to rich flavors that a coffee bean has. Aside from a more full-bodied coffee flavor, using the French Press allows you to make your coffee at the perfect temperature. Using a percolator like the 8-cup stovetop may be a versatile coffee maker for virtually any situation, but the temperature can be limited. Actually, for campers and lovers of percolated coffee, this coffee maker is ideal. However, for the sake of all things French, percolated coffee and coffee from the press do not compare. Once you have mastered this brewing method you’ll be able to enjoy a great tasting coffee again and again. NOTE: ​The Farberware 8-Cup Stovetop percolator does allow you to extract a great amount of oils and flavour. Anything not using a paper filter provides you with a more memorable taste. O.K. you might not agree with this argument. And, we know that you can set up an automated timer on your drip brewer like, for instance, a BUNN MCU. No one is suggesting this would be a bad idea either. These are all time saving choices and perhaps your best alternative to all of this would be instant coffee (do you actually drink that?). However, you still have to wait for the brewing machine to come to a boil and drip over the bean. And as for instant coffee, let’s not even go there. Getting a delicious cup of coffee in under 5 minutes is better than waiting in line at Starbucks. Plus, those 4-minutes can be smartly used by frying up an egg and making a piece of toast to enjoy for breakfast. When it comes to brewing on of the best coffees, the French Press is a simple and straightforward. You boil the water, grind the bean, pour with water, let it steep, then enjoy. There is no complicated machinery and the keep up is a sinch. However, don’t let your friends know this. When you brew them a cup, they’ll thoroughly impressed with your coffee cupping skills. And, who knows, you might kickstart a new coffee culture with your friends. Do you have any idea how much an espresso machine costs? Look at this. The Gaggia Accademia runs in at over $1000. Beautiful machine, but that’s one expensive cup of coffee. If you compare it to the French Press (details coming next), brewing a delicious cup of coffee can be very affordable. Investing in a French Press that suits your style is not going to break the bank. And, since using the French Press is easy to do, doesn’t take too much time, creates consistent cups that are full of flavour, this may be the only coffee maker you need. Great. You have all this knowledge on a vintage brewing method that started with the use of coffee in a cheesecloth being plunged in hot water. You know how to brew 30 oz. of that liquid love, and, if you weren’t convinced before you now have a few more reasons to join the French. However, how do you know which French Press is right for you? Let’s take a look at 5 of the best and biggest brands that provide coffee lovers with the French Press. The KONA French Press is created with a simple yet modern design that adds a nice finish to your kitchen tool kit. It’s made with a high quality carafe (which is a thick borosilicate glass) wrapped in a protective casing that prevents it from breaking. The internal components are made of stainless steel which assure quality and a long life. You can brew a great tasting coffee with the Kona and clean up is a breeze. Simply dispose the used bean and quickly wipe the glass clean and it’ll be ready for another cup. Obviously the previous French Press is perfect for you and a loved one. But what do you do if you have a lot of friends coming over? You get the Chambord 8-cup French Press coffee maker, that’s what. This French Press is the perfect size for serving coffee at a family gathering, group meeting, and even at the office where you work. It also has a resilient glass carafe but it is encased in a stylish and strong stainless steel casing. This Bodum Press even won an award from the American Culinary Institute for the best French Press coffee maker ​in 2004. Even previous customers have claimed that it’s the, “best coffee maker [they] ever owned”. GROSCHE MADRID Premium French Press, 34 oz. Don’t be fooled by the name, you won’t be getting a gross coffee with this French Press. 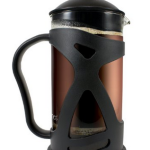 The innovative design of this French Press has made it an instant best seller. It features a stainless steel plunger and with a secondary filter on the lid to guarantee that no coffee grinds make it into your cup. What gives this French Press it’s premium label is not just in the delicious brew you can make, but also with it’s chrome encasing. BODUM Columbia Stainless Steel Thermal Press Pot, 34 oz. It’s difficult making this list and not ​filling it full of the Bodum brand. This company has to be one of the leading makers of the French Press. Remember, they did get their product from the Italian designer. 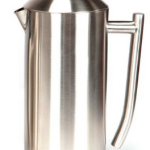 Nonetheless, this stainless steel French Press has a polished finish and a double wall construction to keep your coffee hot for up to two hours. It uses a silicone and mesh plunger to prevent scratching and improves both filtering while reducing the amount of sediment from entering into your cup. Bodum really has a quality line up of French Press coffee makers and this one is by far one of our favorites. Le Creuset Stoneware French Press, 27 oz. Worried that the glass will break? Not a fan of stainless steel? No problem. Le Creuset has designed a vintage looking French Press you’ll likely love. This French Press is made from a dense stoneware providing it with strength and resilience. The enamel exterior is strong enough to resist scratching and cracks. The glazed interior prevents staining and flavour absorption. 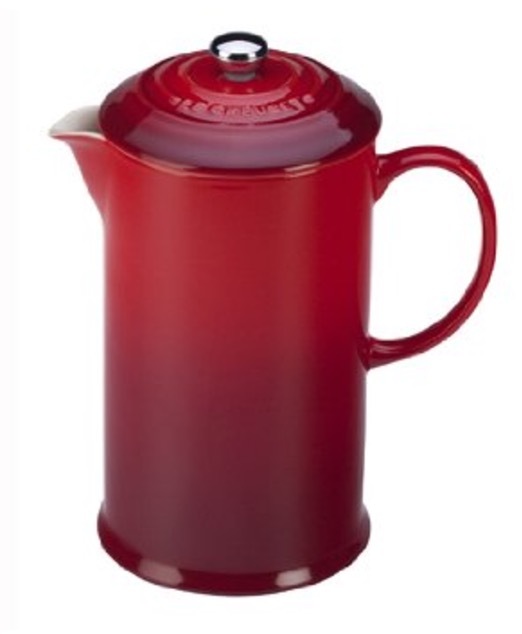 Le Creuset provides an elegant design for the French Press which stands out amongst the standard glass and stainless steel versions you see above. While this coffee maker may seem a bit pricey, you are getting both a coffee maker and a new friend for the kitchen. Here we go again, claiming Bodum is the best. But, hear us out before you decide to click away. The Bodum Stainless Steel Travel French Press is truly the greatest gift to a coffee connoisseur such as yourself (or your partner). Instead of depending upon some grab-n-go coffee from some overpriced chain store, now you can enjoy the quality taste of a French Press coffee as you rush to your job. It comes in many colors and the silicone grip reduces the heat in your hand while keep it inside the container. 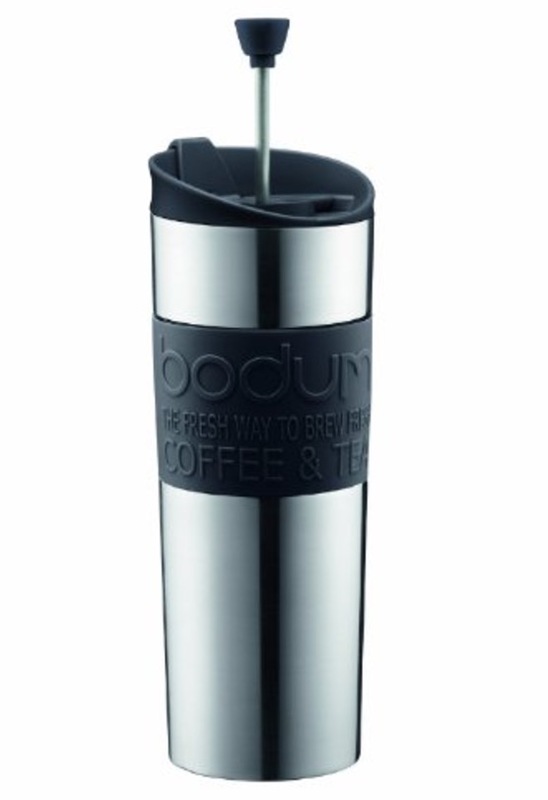 This Bodum invention is a must have if you want to enjoy the best coffee anywhere you go. Well, this is it. We have shared everything we know about the French Press and more. You now have all the knowledge you need to make the best coffee in the world. 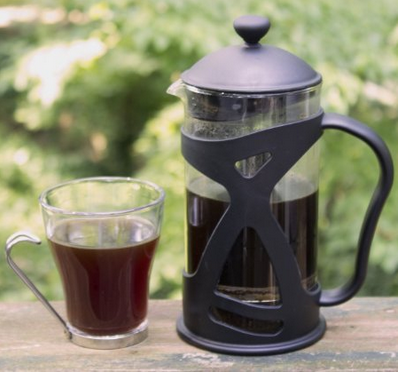 We have suggested a few of the top brands that offer a quality French Press coffee maker. The only thing we’d love to ask is, what time do we come over for a cup?